PersianDNA™ [NEWS] Read our update news! Read about our Activities, News and Updates! Our partner company "computercancer.com" is no longer working with us. The domain name is sold and the company is not offering its services anymore. Thanks! A young Zarathushti child who is only 20 years old, is in urgent need of Bone Marrow. If you are between the ages of 17 years and 50 years of age, kindly fill and mail the application form by visiting http://bloodservices.ca and click on "join the bone marrow registry" to determine whether you qualify for this donation. It was a historical first of its kind, a full day seminar co-sponsored by NAMC and FEZANA that invited speakers from USA (Prof. Jamsheed Choksy, and Prof. Gernot Windfuhr, Dr. Pallan Ichaporia), Sweden (Mobed Kamran Jamshidi), India (Ervad Parvez Bajan), UK (Prof. Almutr Hinze), and Pakistan (Ervad Godrej Sidhwa). 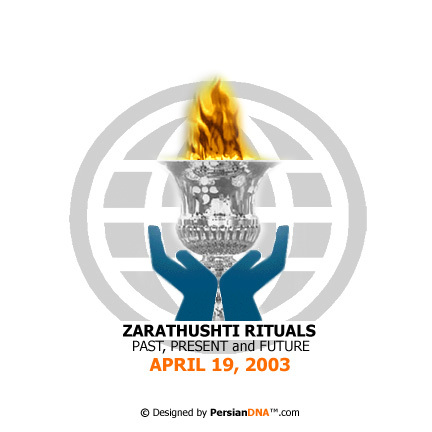 An enthusiastic congregation of some 70 Zarthushtis gathered at Ramada Hotel Toronto Airport, on the morning of April 19 2003 with more than half a dozen Zarathushti clcerics in their Dagli/Pagri adorning the crowd. The spirit of collaboration and support for the seminar was not limited to FEZANA, its member associations, and generous donation of the some community members. It was the FIRST TIME in the history of NAMC that the event was generously supported by the US CHAPTER OF THE WZO to the extent of sponsoring a speaker to the seminar from abroad. While we gratefully acknowledge the support, we sincerely hope that the seeds of close cooperation have been sown through this event, for the Zarathushtrians to work in harmony as we move forward into the 21st century. It is imperative for all to put our minor differences in proper perspective, relative to the MAJESTIC GOAL of preservation of Zarathushtrian Faith around the world. The event however was slightly marred solely by the incident completely beyond the control of the organizers. The SARS (Severe Acute Respiratory Syndrome) outbreak in the eastern Toronto area led to the withdrawal of the speakers from USA and Pakistan from their commitment almost at the last minute. The substitution brought in a talk by Ervad Jehan Bagli and demonstration of the Yasna ritual recorded on a video by Dastur Firoze Kotwal at Colorado State University, and the seminar continued. After due welcome and introduction by NAMC, FEZANA, ZSO and OZCF presidents the first speaker took the podium. Professor Almut Hinze started the day by delivering an enlightening talk on the Prophetic and priestly authority in Zoroastrianism. The paper investigated the dual role of Zarathushtra as a visionary on the one hand and as a priest and initiator of a new type of worship on the other. On the bases of the Gathic passages, it was argued that the prophet derived his spiritual authority from the revelations received from Ahura Mazda. As a prophet he provided the devotional model for Mazdayasnian. As a priest Zarathushtra established a new type of ritual worship preserved in Yasna Haptanhaiti. Zarathushtrian Faith is unique in that the prophet himself has provided the mould and model for institutionalized priesthood as indicated by zaraJushtrotema. The later priestly generation derives its religious authority direct from the spiritual descent from the prophet. The next speaker Mobed Kamran Jamshidi the grandson of Dasturan Dastur Ardeshir Azargoshasp of Iran, gave a lucid account of Tajiks and some of their Tradition. He traced the history of present day Tajikestan along scriptural lines. Among the sixteen lands mentioned in the Avesta and later scriptures, Soghdiana was always mentioned first. From the time of Hakhaamaneshis (Achaemenians) to the Sasanian era the land was known as Soghd-e-Haftashyan, land of seven nests, as seven glorious kings; Jam, Fereydoun, Manochehr, Keykhosrow, Lohrasp, Goshtasp nestled there. During the time of the Arab or Tazis occupation those who converted to Islam came to be recognized as Tazik. Today Tajikistan is a republic state of Central Asia, bordered on the North by Kyrgyzstan, south by Afghanistan, East by China and west by Uzbekistan. Although vast majority of the Tajiks are Muslims, many Tajiks particularly those conscious of their roots, not only claim to be Zoroastrians, but also consider all Tajiks to belong to their forefather’s heritage. A number of these Zoroastrians have been officially initiated and with some scholars, are searching actively to disseminate their knowledge to the world. Tracing the connection with the Avestan culture he referred to the sacred river Daaiti that flow through and Hara-Berezaiti, a mountain peak mentioned in the religious texts are all located in the vicinity of Tajikistan of today. Like Zarathushtis of Iran, Tajiks celebrate Nowruz, Mehergan and Sadeh as the important annual Festivities. They also respect and revere all the elements of Nature. The Mobed also described many other social and cultural attributes of the people and the country. Ervad Parvez Bajan followed with A Historical Perspective of Zarathushti Ritual – its Traditional Values, Spiritual Significance and Social Relevance to the Past, Present and Future of the Faith. His discourse touched on the migration of Parsis to India, and went on to the establishment of Bahgariâ pantha in Navasari. They were the followed by the formation of similar groups viz., Godavras, Bharuchas and the Khambatas in different part of the region. These together with the original Sanjanas represented five ecclesiastical divisions serving the community in 13th century. He also traced the odyssey of the sacred fire from Sanjan via Bahrot to Udvada some five centuries later in 1742. The oldest extant manuscript written by the Meherwan families are housed in the Bodleian library in Oxford. The later manuscripts are preserved in various libraries in India, and at Paris, Munich, London, Oxford, Cambridge, Copenhagen and Florence. Religion, he stressed, cannot be understood by our imperfect reason alone, the element of Faith is crucial for its complete comprehension. Faith in religious practices must be imbued in the younger Mobeds and in turn to the Zarathushti community at large, for without the basic cornerstone of spiritual conviction, true guidance cannot be ministered with reason alone. Rituals are the expressions of religious aspiration of the community, and the tranquility of these solemn acts appeal to the spiritual sense of mankind. Changes in the mechanics of the ritual are inevitable due to varying circumstances in time. However, that should in no way weaken the faith. Loss of faith in these practices result only from misdeeds and deceit. He ended with the quote from Vd XVIII.6 describing a true Athravan is one, who seeks wisdom, relieves distress, which causes one to reach the Best existence. The colloquy on the Significance of Some Zarathushti Rituals, delivered by Ervad Jehan Bagli began with the historical background of the absence of rituals and priesthood as we know today in the Gathic era. This followed, the gradual evolution, of these practices in the Younger Avesten times culminating in an explosive growth of rituals in the priest laden society of the Sasanian period. Stressing the fact that rituals depict a precious treasure of doctrinal information from the scripture, he elaborated in detail the flower exchange ceremony of the Afringan recital. He explained how the two performing priests assume the representation of the cosmic duality of the two existences; Zaotar for Mainyava –the celestial and Raspi for Gaethya –the terrestrial. He then elaborated on the interaction between and the transmission of souls from, spiritual to the physical world and back, which is portrayed by the flower exchange. It was emphasized that the point of HUMATANAM recital determines the completion of the circuit of communion through the Supreme Wisdom - Ahura Mazda incarnated by the holy Fire in the sacred space. In the remainder of the presentation he developed the importance of purity in Zarathushtrian Faith and subsequent evolution of purificatory rites to attain the ritual purity for the participatory practices. The talk ended with delineation of the inner liturgy of Yasna. This was followed by the video of the Yasna ceremony in which Dastur Firoze Kotwal enacted the ritual together with an explanatory commentary by a member of the Department of Religious Studies, Colorado State University. The seminar ended with a ninety minutes session that started a discussion with Speaker Panel followed by an open forum with questions from the floor. We sincerely acknowledge the support and guidance of FEZANA president Mr. Firdosh Mehta and the Trustees of US Chapter of WZO for their significant contribution. PersianDNA™ has lunched its NEW website. It is one of the Greatest Zoroastrian websites on the .NET which includes all the AVESTA in two languages, English and Avestan. It is the best source of Zoroastrian information and can be use as a complete reference. The new website is FAST, SIMPLE, USEFUL and GOOD LOOKING with a friendly CGI. We are still working on it but good news is, No more Mehrdad™ offline! Now you will have Mehrdad™ Newsletter Online VIA email. Right into your INBOX. Our goal is to have the AVESTA with all the details together on our website. We have already completed the Avestan version of YASNA and a part of Khordeh Avesta and they are available at ZOROASTRIAN link on the website. PersianDNA™ is now co-operating with other Zoroastrian Communities in USA, Canada, Sweden and other countries, helping their online projects from Design to Developing websites. PersianDNA™ and computercancer.com JOIN together to make a better co-operation and give you a better performance of our services. ClubDNA™ has created on YAHOO! server and got it's first member as "xerxesonline". You can find everything there... It's one of the best Persian | Zoroastrian Club on YAHOO! A source of information regarding Zoroastrian and Persian History before Islam. The next step for us is to provide you our E-Mail, Chat, Online Music, Women Rights, Religious Minorities and Human Rights in Iran, as well as our online shopping. CONTAINS OVER 198 PAGES SO FAR! the BIGGEST Religious Database and Information on Zoroastrianism! Some pages are still under construction, Please be Patient with us because It's a lot of work! A huge religious database and information which needs to be sorted, edited, translated and designed for a better look. We are working hard to make it better and the best on its kind. "Thank you for supporting and visiting us".